A 2009 federal law, the Family Smoking Prevention and Tobacco Control Act, prohibited the sale of cigarettes with characterizing flavors other than menthol or tobacco, including candy and fruit flavors. However, this prohibition did not apply to other tobacco products. In recent years, tobacco companies have significantly stepped up the introduction and marketing of flavored non-cigarette tobacco products, especially electronic cigarettes (e-cigarettes) and cigars. 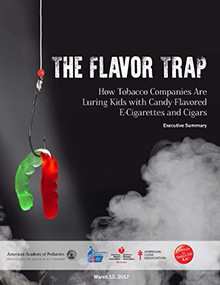 This report documents the widespread availability of these flavored other tobacco products and the scientific evidence demonstrating that flavors play a critical role in the popularity of these products among youth. These flavored products are undermining the nation's overall efforts to reduce youth tobacco use and putting a new generation of kids at risk of nicotine addiction and the serious health harms that result from tobacco use. In recent years, there has been an explosion of sweet-flavored tobacco products, especially e-cigarettes and cigars. These sweet products have fueled the popularity of e-cigarettes and cigars among youth. Studies show that flavors play a major role in youth use of tobacco products such as e-cigarettes and cigars. Tobacco companies have a long history of developing and marketing flavored tobacco products as "starter" products that attract kids. Strong FDA regulation is needed to protect kids from flavored tobacco products. These products are available in a wide assortment of flavors that seem like they belong in a candy store or ice cream parlor – like gummy bear, cotton candy, peanut butter cup, cookies 'n cream and pop rocks for e-cigarettes and chocolate, wild berry, watermelon, lemonade and cherry dynamite for cigars. A 2014 study identified more than 7,700 unique e-cigarette flavors, with an average of more than 240 new flavors being added per month. Sales of flavored cigars have increased by nearly 50 percent since 2008, and flavored cigars made up more than half (52.1 percent) of the U.S. cigar market in 2015, according to Nielsen convenience store market scanner data. Further, the number of unique cigar flavor names more than doubled from 2008 to 2015, from 108 to 250. While there has been a steep drop in youth use of traditional cigarettes, overall youth use of any tobacco product has remained steady in recent years due to the popularity of tobacco products like cigars and e-cigarettes – products that are predominantly flavored. From 2011 to 2015, current use of e-cigarettes among high school students increased more than ten-fold – from 1.5 percent to 16 percent – according to the National Youth Tobacco Survey (while the 2016 Monitoring the Future survey shows the first evidence of a decline in youth use of e-cigarettes, it also shows that e-cigarettes continue to be the most popular tobacco products among kids). In addition, more high school boys now smoke cigars than cigarettes – 14 percent vs. 11.8 percent. A government study found that 81 percent of kids who have ever used tobacco products started with a flavored product, including 81 percent who have ever tried e-cigarettes and 65 percent who have ever tried cigars. Youth also cite flavors as a major reason for their current use of non-cigarette tobacco products, with 81.5 percent of youth e-cigarette users and 73.8 percent of youth cigar users saying they used the product "because they come in flavors I like." Flavors improve the taste and reduce the harshness of tobacco products, making them more appealing and easier for beginners – often kids – to try the product and ultimately become addicted. Since most tobacco users start before age 18, flavored tobacco products play a critical role in the industry's marketing playbook. Flavors can also create the impression that a product is less harmful than it really is. After years of delay, the U.S. Food and Drug Administration (FDA) in 2016 issued new rules for previously unregulated tobacco products, including e-cigarettes and cigars. Despite the strong evidence that flavored tobacco products are attracting and addicting a new generation of kids, legislation has been introduced in Congress that would greatly weaken FDA oversight of e-cigarettes and cigars, including the many candy-flavored products on the market. Congress should reject these proposals. In fact, the FDA should strengthen its rules by banning all flavored tobacco products.